Stronger surfaces with durability similar to that of natural stone – HI-MACS® stands up to everyday scratches. 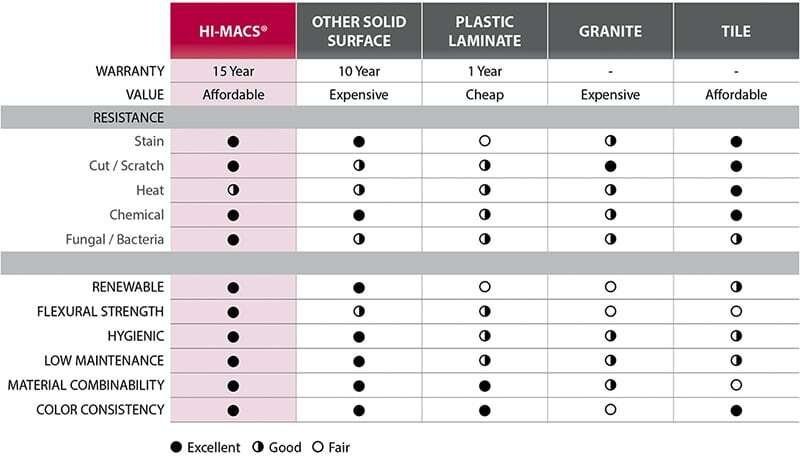 Should you accidentally inflict a deeper scratch or surface impression, a trained professional can easily resurface your HI-MACS® thanks to its sealant-free consistency. HI-MACS® is seamless & non-porous without crevices or surface irregularities where harmful bacteria and mold may reside. Unlike other surfaces, it does not require a regular reapplication of sealants or waxes against natural pits and cracks to maintain hygienic properties. Built to last a lifetime, HI-MACS® endures everyday wear and tear with higher resistance to stains, chemicals and heat. With proper care and maintenance, HI-MACS® will remain beautiful and durable for many years serving you and your family. HI-MACS® offers greater value for lesser price. In other words, guaranteed quality with a price tag that won’t break your budget. Upgrade your kitchen and bathrooms without expanding your budget. HI-MACS® can be easily fabricated, heated and bent, enabling the product to meet the most challenging 3D designs. With HI-MACS®, you can achieve what was once impossible. Let your imagination lead the way while you design the kitchen and bath of your dreams. With easy-to-care and repairable properties, no matter if it’s a scratch, stain or crack, HI-MACS® can be restored to its original state by a certified professional. HI-MACS® supports a greener earth by using sustainable materials and an eco-friendly manufacturing process. LG Hausys fully stands behind HI-MACS® quality, which is why we offer a 15-year transferable warranty keeping our homeowners best interests in mind. LG Hausys fully stands behind its HI-MACS® quality countertops made in the USA. They offer a 15-year transferable warranty, the best in the industry. From their manufacturing process to final counters delivered to your home, customer satisfaction is at the core of everything we do. Understanding the advantages of HI-MACS® solid surface helps homeowners and our designers explore new ideas and possibilities, hence the slogan “A New Generation of Inspiration”. The ability to deliver superior countertops to you at the right time and price without putting a stop on your budget is a significant tiebreaker. HI-MACS’s global recognition as affordable luxury with outstanding quality is well known among industry professionals and the Sierra Remodeling sales and design teams. Need help in picking out countertops? Call us at (520) 459-3164 and, visit our showroom floor and our many HI-MACS samples. 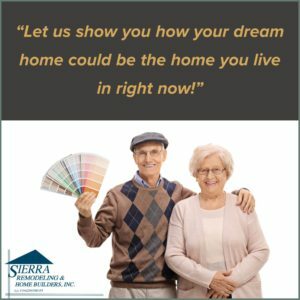 We are located at 1840 S. Highway 92 in Sierra Vista, Arizona! Sierra Remodeling remodeled my porch. They were very good. They cleaned up after themselves. I am pleased with the end result. It was a good price.